Italian Intrigues has been inactive for some time. I am restarting it today with a post that first appeared in Novel Adventurers in 2011. According to an Italian legend, the Magi stopped at an old woman’s hut on the night of January 5, asking for directions to the Christ child. The old woman didn’t know, so they asked her to join them. She told them that she was too busy cleaning her house. Later, when she saw the bright star, she changed her mind and went in search of the manger with gifts but was unable to find it. In one version of the legend, she became so distraught at not finding the child that she cried. Her tears fell onto her broom, which in her haste she had brought along. The purity of her tears gave magical powers to the broom, allowing her to fly on it. 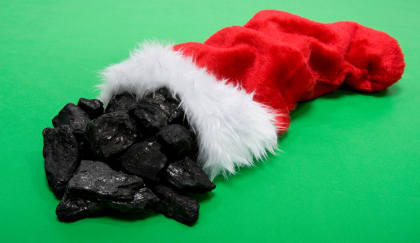 good children’s stockings with presents and candy and leaving lumps of coal for bad ones. The coal isn't such a bad thing, because it's almost 100 percent sugar. Because the Befana is a good housekeeper, she may also sweep a bit. The Befana tradition has existed on the Italian peninsula for centuries, and it may have it’s origin in an ancient Roman celebration called Saturnalia, which began around winter solstice and lasted for about ten days. At the end of the festival, Romans went to the Capitoline hill to have their augurs read, perhaps by an old woman. The Befana is dressed in old, tattered clothing with a black shawl. She’s smudged with soot because she comes through the chimney like Santa Claus(how does his beard stay so white!). Epiphany itself with processions, fireworks, and more. 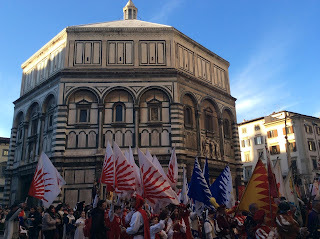 In Vatican City, people in medieval dress march to St. Peter’s with gifts for the Pope; in Venice, the Regatta della Befana is raced on the Grand Canal; in Florence, a medieval parade from the Pitti Palace marches across the Ponte Vecchio to the cathedral with flag twirlers and antique musical instruments. When I’m asked what we do for Befana in America and I say we don’t have Befana, people—old and young alike—are stunned. They shake their heads in wonder. No Befana! How can that be? 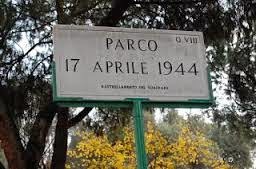 The area of Rome where I live was dubbed Nido di Vespe (wasps’ nest) by the Nazis during World War II because it housed a major network of partigiani, the guerrillas who engaged in sabotage and other anti-Nazi activities. The Germans ultimately swept through with a mass roundup on April 17, 1944—seventy years ago yesterday. By the beginning of 1944, Rome was in chaos: the allies were marching from the south; troops had landed at Anzio; the king had fled; the Italian government had surrendered to the allies; the Jewish ghetto had been swept and many of its citizens sent to Auschwitz. The Nazis were in control. Against this background the partigiani stepped up their activities in central Rome, culminating in an attack near the Spanish Steps in which 33 German soldiers were killed. The Nazis retaliated with a massacre on March 24, 1944 with 335 Italian men killed—ten Italians for each German, plus five for good measure. On April 10, Easter Monday, a partigiano shot three German soldiers at point-blank range in a trattoria near Cinecittà. For the Nazis, this was a last straw. At 4 AM on April 17, German troops blocked all access to this neighborhood, known as the Quadraro, going house to house and rounding up about 2000 men between the ages of 16 and 60. Half of these managed to escape, but 947 were transported to concentration camps where they were forced into hard labor. Known in Italy as the Schiavi di Hitler (Hitler’s slaves), in Germany they were called Volunteers for Germany. About half of these men died in the concentration camps. 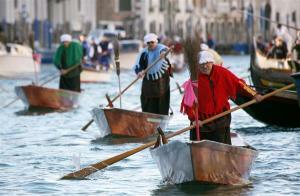 The event is known as the Rastrellamento del Quadraro (the Raking of the Quadraro). 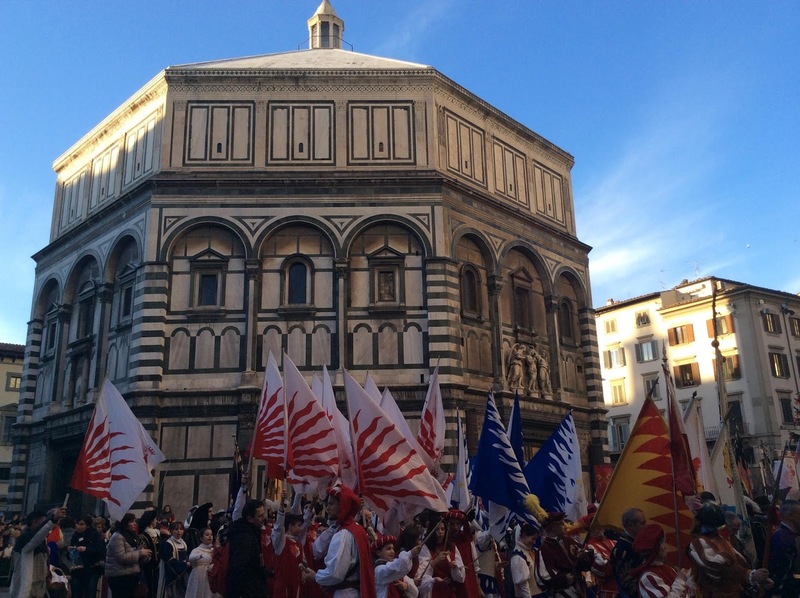 It was the second-largest Nazi roundup in Italy after the Jewish ghetto in Rome. Each year, there is a commemoration. On this, the seventieth anniversary, there are several days of events, including concerts, releases of a new book and a video, art exhibitions, and others. Yesterday, I went to a wreath-laying ceremony. A group of local dignitaries, military leaders, and citizens—some representing families of victims of the rastrellamento—assembled near the spot where the detained men were initially held. A military band played the national anthem. A couple of aging men held banners. The band had scurried to the park by bus while we marched and reassembled, performing again. The wreath was positioned in front of the monument, and representatives of various levels of government spoke. A man from one of the affected families laid a bouquet. I feel honored to live in a neighborhood with such roots. Next week I’ll continue with a post about my visit to Sicily. Yesterday I went to a birthday party. When the birthday girl, my friend Gaby, invited me a couple weeks ago, she said, “I’ve ordered pan brioche.” I’d never heard of this before, so I asked about it. Gaby said, “Oh, I used to see it at parties. It’s a collection of sandwiches all put together inside bread.” I had trouble getting my head around that. Somehow, I imagined a loaf of bread hollowed out with sandwiches stacked inside. Then I forgot about it until I arrived for the party. I live very nearby and turned up as the first guest. At her request, I’d brought a plate of my famous deviled eggs. 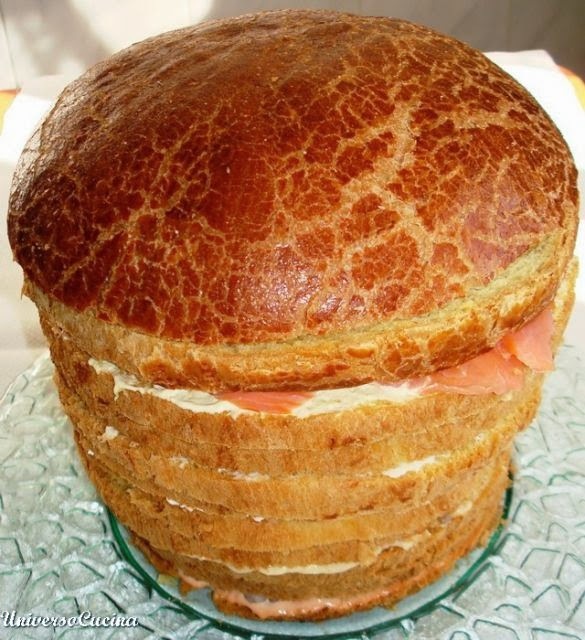 “And here,” she said, “is the pan brioche.” I saw a tall round loaf of bread encased in cellophane and topped with a red bow. I still had trouble understanding how it worked. Eventually, when I was no longer the lone guest, we opened the package—a somewhat difficult task because the cellophane had been taped as if to ward of an invasion. Even with two sets of hands and a pair of scissors, we were almost thwarted in our attempt to breach the fortress. The bread had been sliced horizontally. Gaby removed the top piece, which she labeled “the hat.” revealing four bamboo skewers holding the slices in place much as toothpicks hold together club sandwich triangles. It made a festive party food, and I’m sure to get one at some point in the future. The shop where Gaby had this one made is just down the street. I’m not sure I’m up to tackling this in my own kitchen. I'll return to my tales from Sicily in two weeks. Next week, I'm writing about a World War II anniversary in my neighborhood. Yesterday was the official first day of spring at my house because I left the doors to my terrace open all day. I marked it by doing what my Italian neighbors call Easter cleaning—that is, spring cleaning. I worked at a leisurely pace by doing a task (or part of one) then retiring to the terrace to read a chapter (Elizabeth Zelvin’s excellent Voyage of Strangers). Sitting on the terrace gave me an olfactory tour of my neighbors’ homes. On this first day of daylight savings time in Italy, I charted my neighbors’ waking hours by the aroma of espresso wafting through the Rome air. 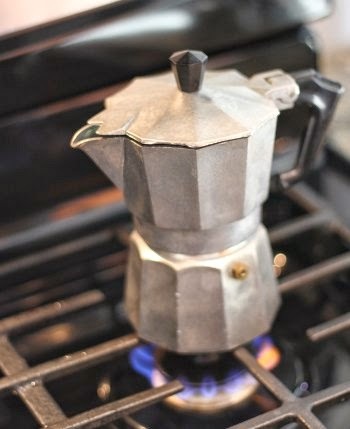 I imagined that I could hear the hiss as steam rose in each caffeteria (the stove-top espresso maker that graces Italian kitchens) and the gurgle of the last drop of coffee entering the pot. People rose at different times throughout the morning, and the coffee ritual repeated itself with each awakening. I drank my own cup before any of my neighbors stirred, and found myself making a second round before too long. After placing all movable furniture (chairs, small tables) onto non-movable pieces (bed, sofa), I returned to the terrace for another chapter. This time, someone was roasting peppers; the tang tickled my tongue as I contemplated what dish the cook planned. Nice fat noodles with sausage and peppers, perhaps. Or a very traditional side dish combining the peppers with roasted eggplant and zucchini. Whatever, it made me wish I had more than half a red pepper in my fridge. Retuning to the matter at hand indoors, I plugged in the vacuum. After sweeping through half the apartment, I went back to the terrace. This time, I sniffed someone baking a chocolate cake. That’s a rare smell. Usually for Sunday pranzo, people visit a pastry shop—in years past, one of the few businesses open on Sunday. 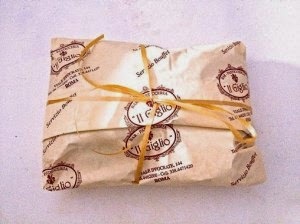 Traditionally, the treats from a pastry shop are wrapped in paper (proclaiming the identity of the shop) and tied with a ribbon. It common on Sunday mornings to see people scurrying through the streets with this precious cargo. But this week, a luncheon table in my building carried a homemade cake. Finished the vacuuming. When I retired to the terrace this time, I was blasted with the heady scent of that most traditional of Sunday dishes—chicken roasted with potatoes and seasoned with rosemary and garlic. My fingers slipped over the chicken skin as I imagined rubbing it with olive oil. The prickle of the rosemary needles tickled by fingers in my imagination. 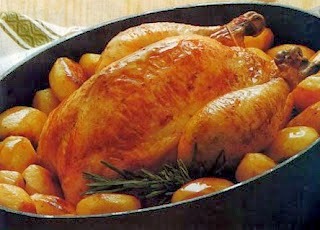 Alas, while my cupboard held potatoes and garlic and my terrace a pot of rosemary, I had no chicken. After being enticed by the scents of my neighbors’ kitchens, I entered mine and made a sandwich from leftover pork roast (studded with garlic and rosemary) accompanied by a glass of freshly squeezed blood orange juice. No aroma to reveal myself to the neighbors. I settled on the terrace again, munching my sandwich and getting back to Diego and Rachel (Elizabeth Zelvin’s characters). 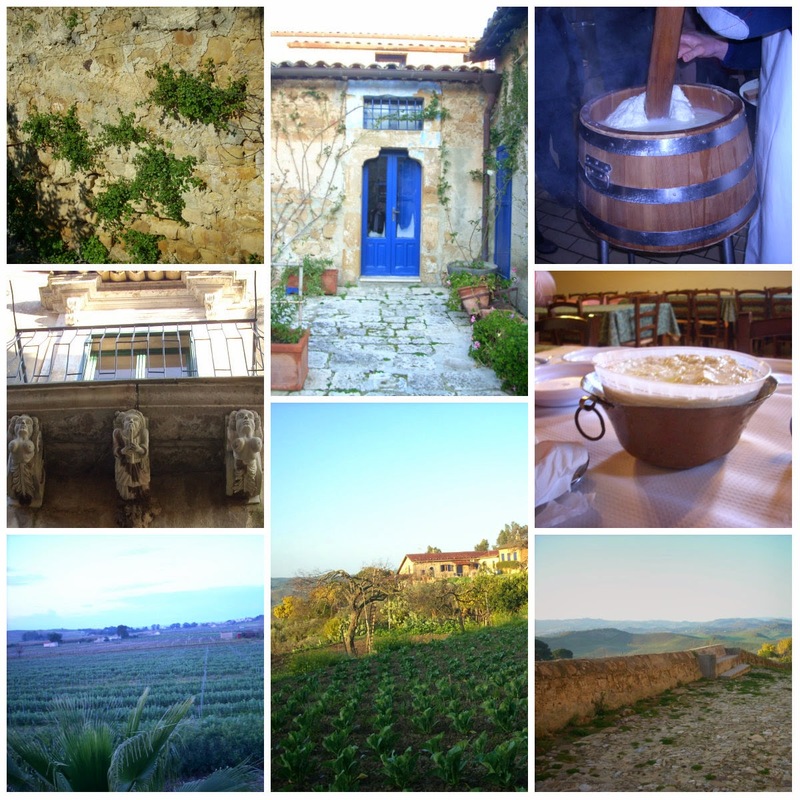 I’ve just returned from a whirlwind journey to Sicily as the guest of Cronache di Gusto (News about Flavors) where I visited five wineries and a cheese maker, saw some incredible sights, and enjoyed generous Sicilian hospitality. Enjoy the pictures below. I’ll write more next week. One of my favorite pastimes in Italy is shopping at the markets for food. Rome has dozens of markets scattered throughout the city. 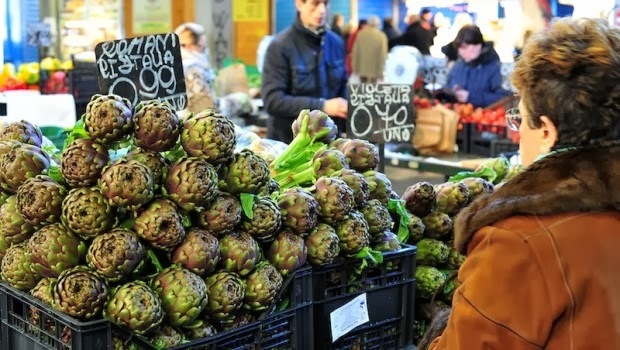 The best known, Campo di Fiori, is an outdoor market in the center of Rome. While locals do shop there, it’s a tourist spot as well and has prices and products targeting the out-of-town crowd. There’s another tiny street market in the center near Via Margutta, Gregory Peck’s street in Roman Holiday. In this tony neighborhood, tourists pass by on the the parallel Via del Corso and Via del Babbuino, missing out on one of the best sites and experiences of the city. When I first came to Rome, I haunted the markets all over the city, getting off buses to visit a new one. I learned a great deal about Italiann, food then. On one of these excursions I first encountered puntarelle, a special Roman dish made from a type of chicory. The leaves must be stripped from the stems, the part that’s eaten, and I watched a man using a special tool for the job. 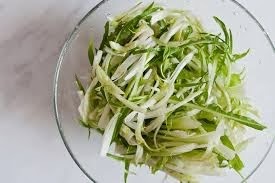 In my own market, I find bags of cleaned puntarelle, but so far, I haven’t seen anybody cleaning it. The stems are dressed with garlic, anchovies, olive oil, and white wine vinegar. During my first year in Rome, I shopped with a little old man and woman who were only licensed to sell eggs. I bought four at a time, and they wrapped them in brown paper. After I had been buying from them for several months, the woman whispered, “Vuole delle fragole?” Fragole are strawberries, and I thought buying some a good idea. She took me to the trunk of her car, shielding the view with her body and placing me in line to do the same. Inside, she revealed some stunning small purple grapes. She was selling them without a license and making them available to good customers. I bought some; they were good. That’s how I learned that some grapes can be called strawberries, too. During the fall and winter months, proprietors of vegetable stands cut vegetables to make minestrone mix. The mixture varies from stall to stall, but it will include root and leafy veggies. Sometimes it will include onion or shelled beans; sometimes not. It’s great to take a kilo home, mix it with some stock and a bay leaf, and let it simmer while I work. And lunch is ready. I haunt just one market these days. It’s a five minute walk from my home, and I think it’s one of the best markets in the city. 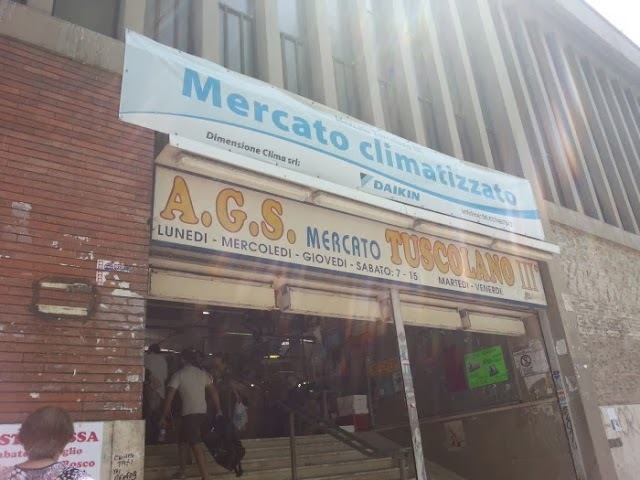 Covered, with heating and air conditioning, Il Mercato Tuscolano III feeds me. About 60 stalls spread throughout the hall, and unlike some markets I know, no stalls remain unused. One stall sells many varieties of mushrooms, another sells 20 or more varieties of fresh pasta. The center of the hall holds a stall selling fresh buffalo mozzerella. Branching of from that are many vegetable and fruit stands. Fresh eggs? Several stalls sell them. One woman sells “exotic” items. She sometimes has sweet potatoes or plantains. You can buy a slice of pizza if you’re hungry or a cup of espresso in the corner bar. And in case you have other needs, you can buy paper towels or a spool of thread, get your shoes repaired, or pick up fresh flowers. A couple of times, I’ve taken friends visiting Rome to the market—sometimes making lunch from our purchases. Everybody going with me has been enchanted, so far. Wish you could join me. I’m off to Sicily in a couple of days. I’ll post from there next week—probably just photos.